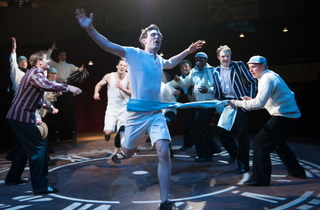 Two problems face any stage adaptation of the hit 1981 film 'Chariots of Fire', which depicts sprinters Eric Liddell and Harold Abrahams's triumph against the odds at the 1924 Paris Olympics. One is that nobody can hear the title without thinking of Vangelis's stirring theme tune; the other is that everybody already knows the ending. So it's to the credit of this superb production – directed by Ed Hall, and now in the West End after a speedy transfer from his Hampstead Theatre – that it tackles these issues head-on. The Vangelis tune is the first thing we hear as the lithe, astonishingly energetic cast run round Miriam Buether's beautifully-designed set: a revolving circuit, with specially-constructed 'stadium seats' on the stage allowing some audience members (including me) to come as close to the action as possible. Mike Bartlett's pitch-perfect adaptation segues seamlessly between Abrahams's troubled time at Cambridge and Liddell's more relaxed Christian Scottish background. Bartlett emphasises the fact that despite their very different circumstances, both runners were outsiders: Abrahams for his Jewishness (even his Cambridge professors are unnervingly anti-Semitic), and Liddell for the uncommon Christian conscience that prevents him from sprinting on a Sunday. Several races are enacted on stage, ratcheting up the tension even when we know the outcome. 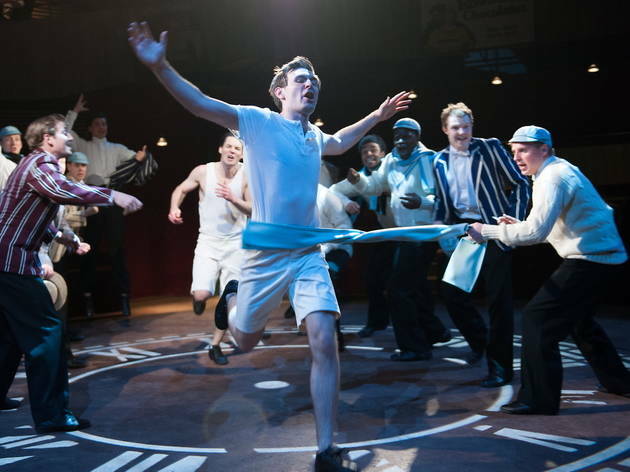 And the cast of 21 is one of the most hard-working and multi-talented I've ever seen – as well as running (by the end of a week of shows, they must have completed several marathons), they do press-ups, sing, play instruments and dance. James McArdle (Abrahams) and Jack Lowden (Liddell) shine as the two leads; Nicholas Woodeson is excellent as Abrahams's moustachioed coach, Sam Mussabini; and Tam Williams, as Lord Lindsey, deserves a special mention for his prowess at clearing hurdles. An unmissable show worthy of London's Olympic year. We decided to step in the theatre last minute, barely knowing what to expect. What a great surprise ! Congratulations to the actors whose energy and faithfulness gives full credibility to this ambitious creation. We will remember this for long ! Amazing! Wonderful! Excellent music, acting, singing, dancing, and of course running! Travelling Europe on a Reformation tour with our American church group, this was a perfect theater choice. It confirms the stand we take for our Lord and faith in our lives. Loved this production from beginning to end. A Winner!! I really enjoyed this, I got seats on the stage/stadium area and it was very exciting. Yes, we all know the story but the way it was presented was brilliant. Go and see for yourself! Awful! Very poor! Simply a money spinner off the back of the Olympics! Fits the London Olympics spirit! Saw the show on Saturday night afer attending the Olympic Rowing at Eton Dorney in the morning. It was excellent. The opening and closing scenes are a very effective link between Paris in 1924 and London in 2012. Liddell, Abrahams and the whole production are inspirational and compelling. It is definitely 'not to be missed'! Absolutely excellent, very moving. Superb. Would highly recommend. Brilliant show, first class entertainment, original and a great night out. Do go, it's defininately a show worth taking the time to see.